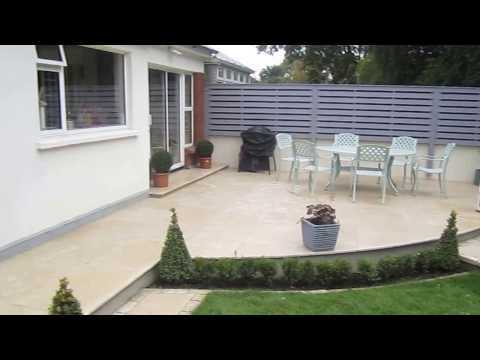 I won this landscaping design and build contract in Shanganagh, Co Wicklow through my website Landscaping .ie. 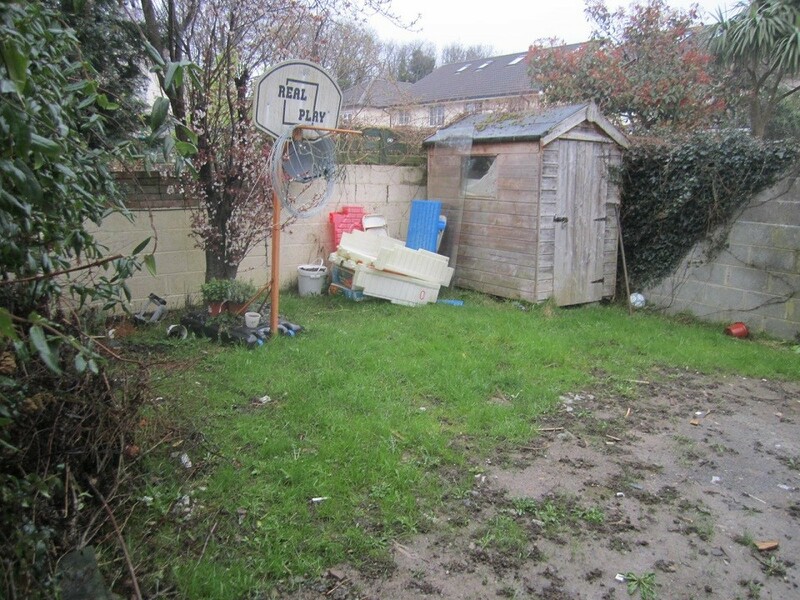 On the first viewing, this garden was in a state of disrepair. 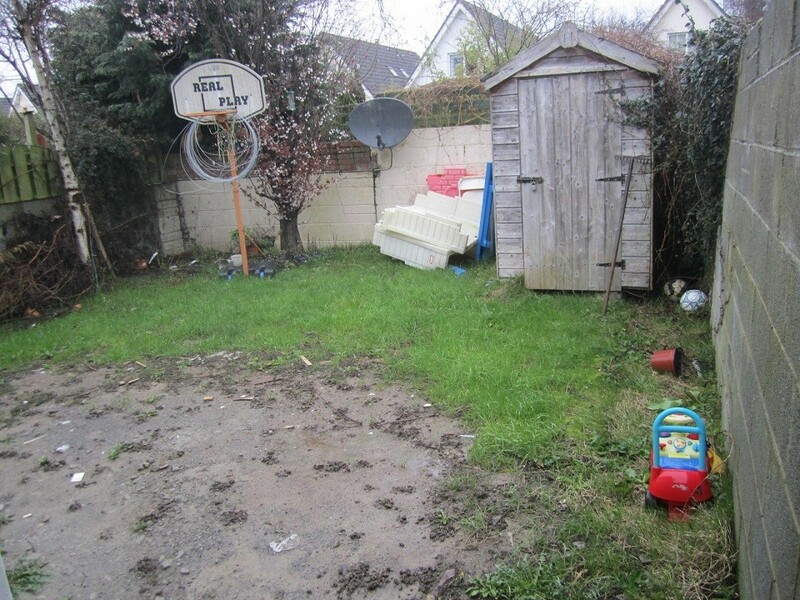 The surrounding walls were different levels and finishes, only half the lawn remained, the rest of which being mud, the ground level was uneven, sloping towards the house, leaving a large step accessing the garden from the double doors. The aspect of the garden was good, being South Westerly so received plenty of sun. There was an old 6×4 shed and two trees Betula ‘Jacquemontii’ and Prunus pissardii, including various climbers on the walls. 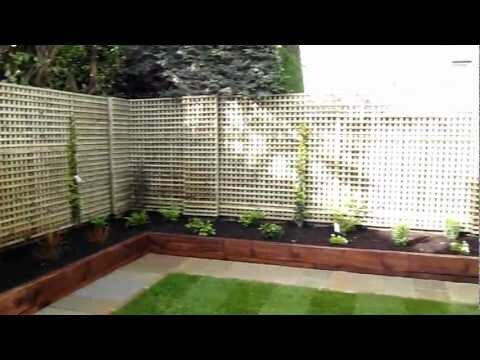 Armed with the above information I created a scaled low maintenance garden design which took into account all the factors discussed. 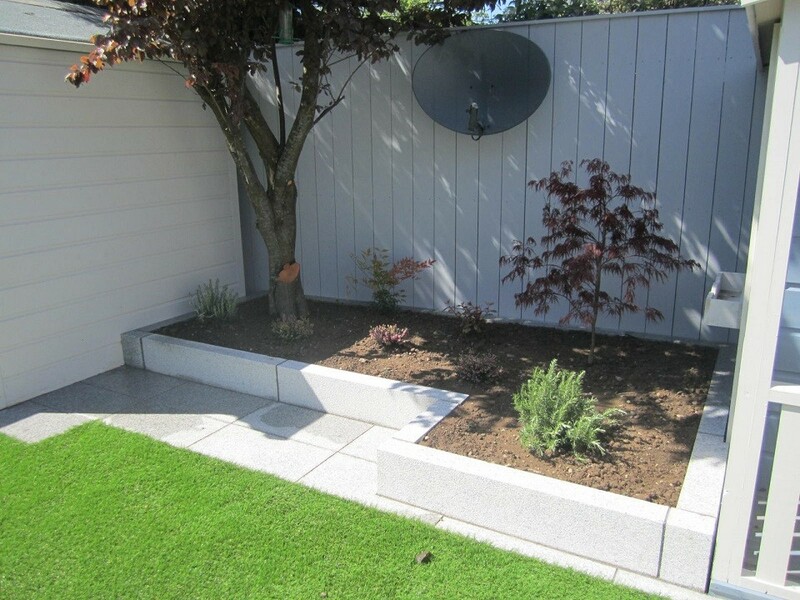 A low voltage garden lighting scheme had to be sacrificed due to budget restrictions, but we did install a framework of cableing through the garden for future garden light installation. 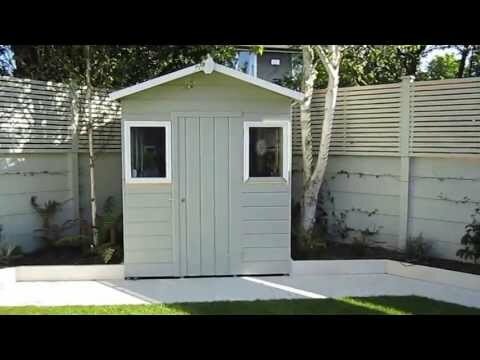 The surrounding walls were clad in 150x22mm pressure treated Scandinavian Spruce boards connected with nails to 50x50mm pressure treated joists. The 50x50mm pressure treated joists were connected to the wall using 110mm express nails. The whole fence was topped with 50x22mm latt with over hang, this small detail really finished the look but more importantly will extend the life of the structure going forward. 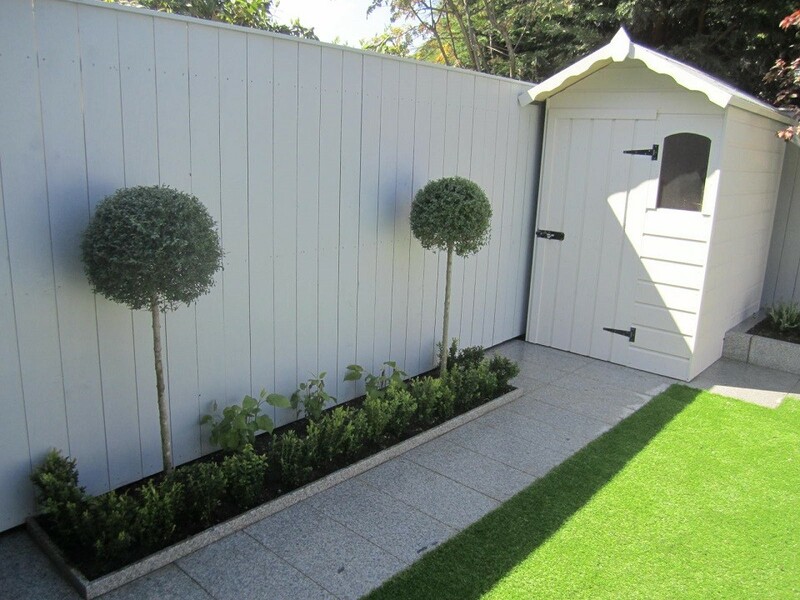 The fence was then painted in Ronseal ‘Pebble’. 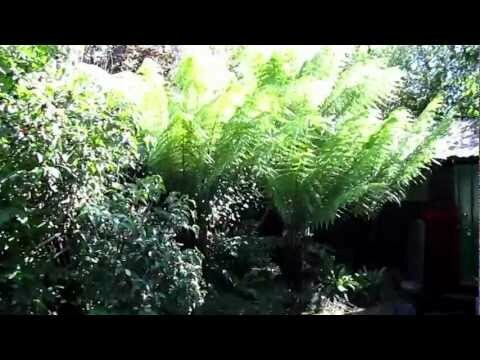 Once the fence was installed the base gave us our level throughout the garden. 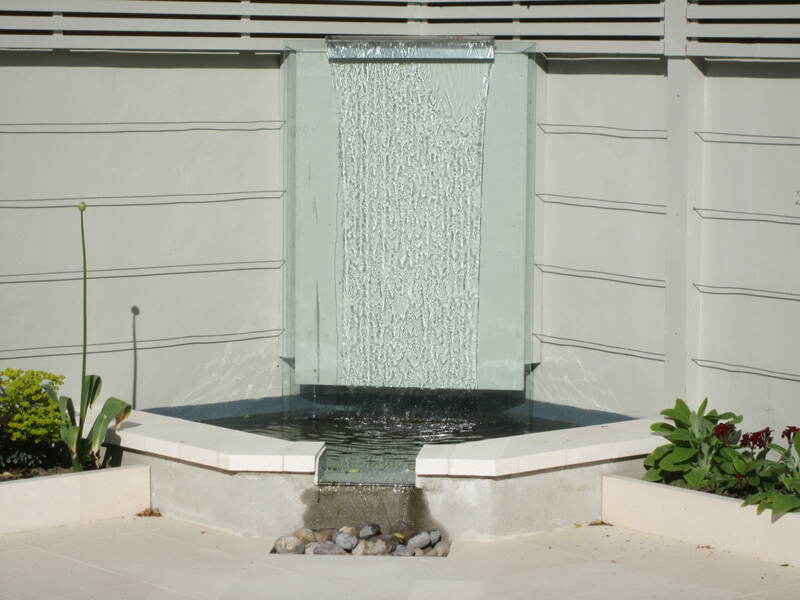 To reduce height of step entering the garden from the double patio doors all levels were increased using compacted quarry screenings, a step was constructed down the side of the house to act as a retainer with an ACO drain in front to remove water run off. 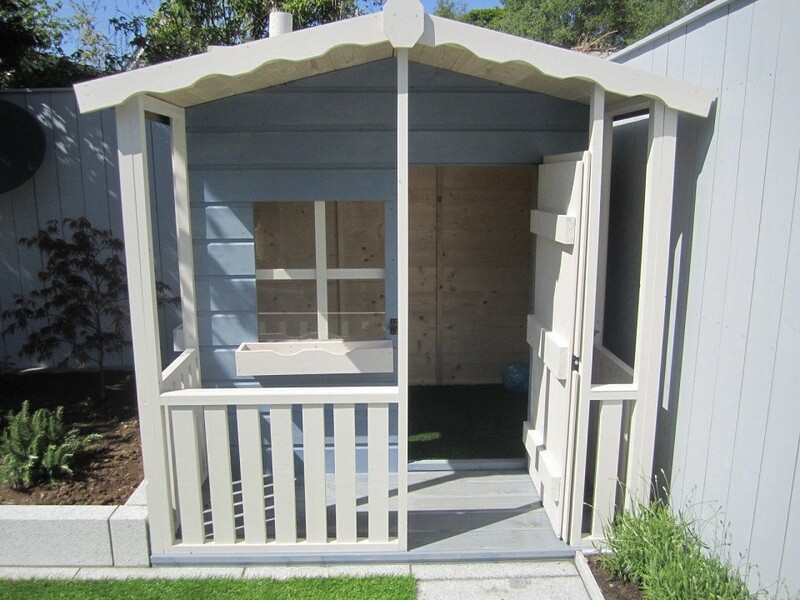 The two garden sheds were then installed, the 6×6 Wendy house to the right including verandah, and a 6×4 utility shed to the left. 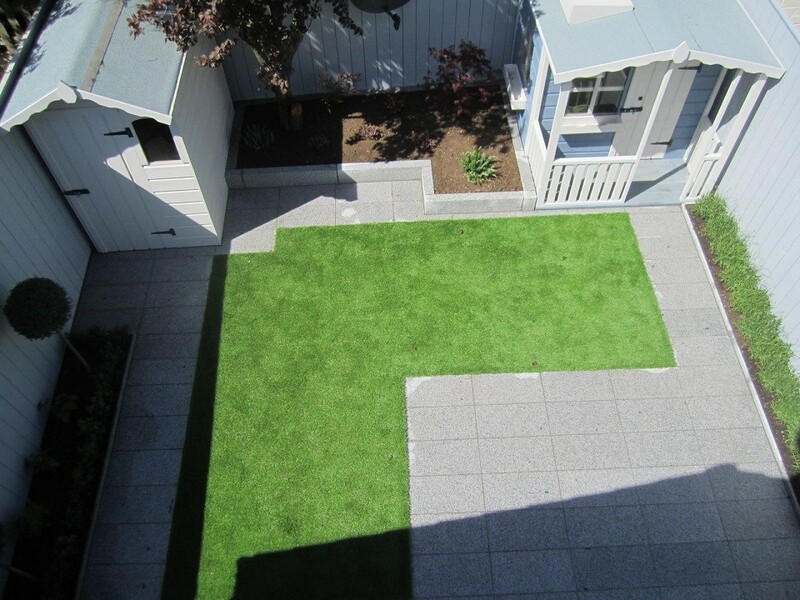 600x300x20mm flamed silver granite slabs were used to create the patio and paths within the garden. 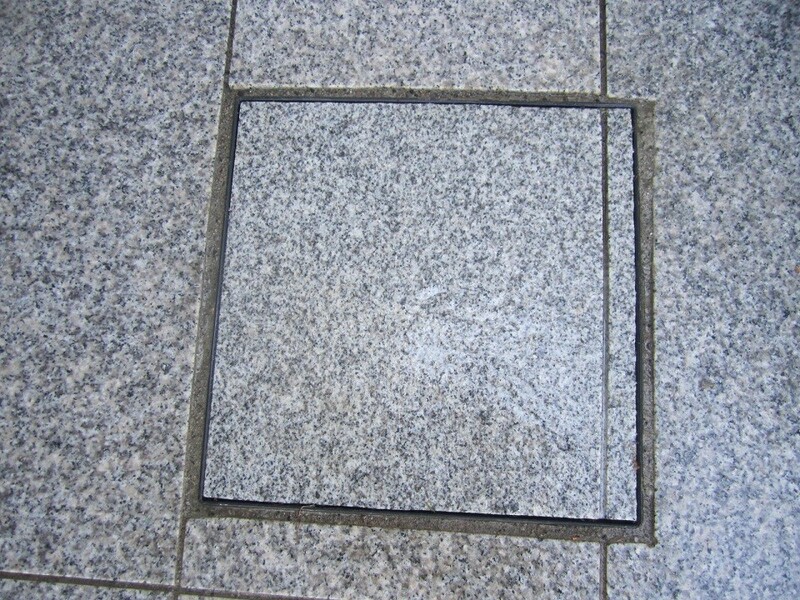 The slabs were laid in a full bond patten with 5mm grouting gaps. 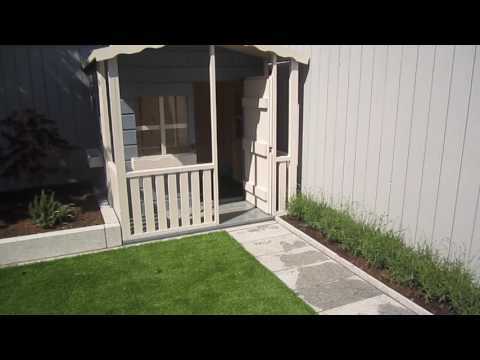 This style gives a real geometric look to a patio space. 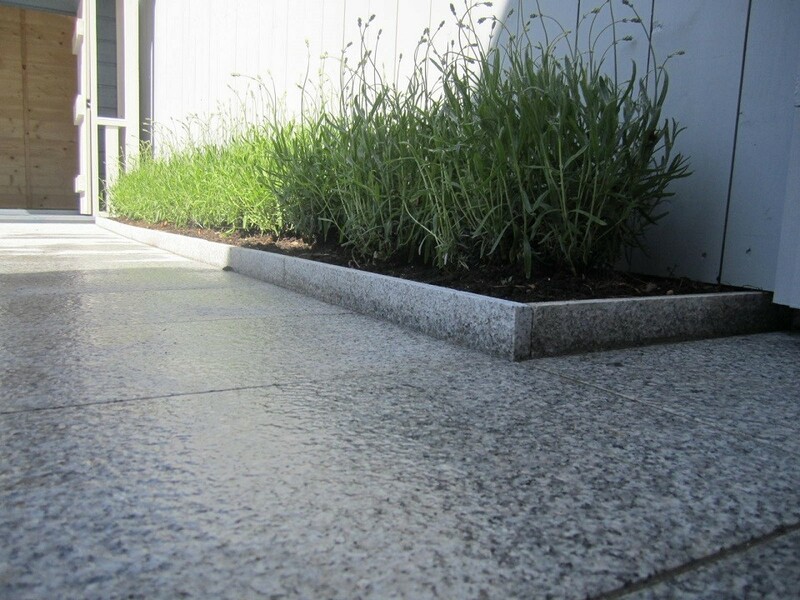 The raised beds comprised of two either side using granite paving off cuts installed on the edge, 50mm high. 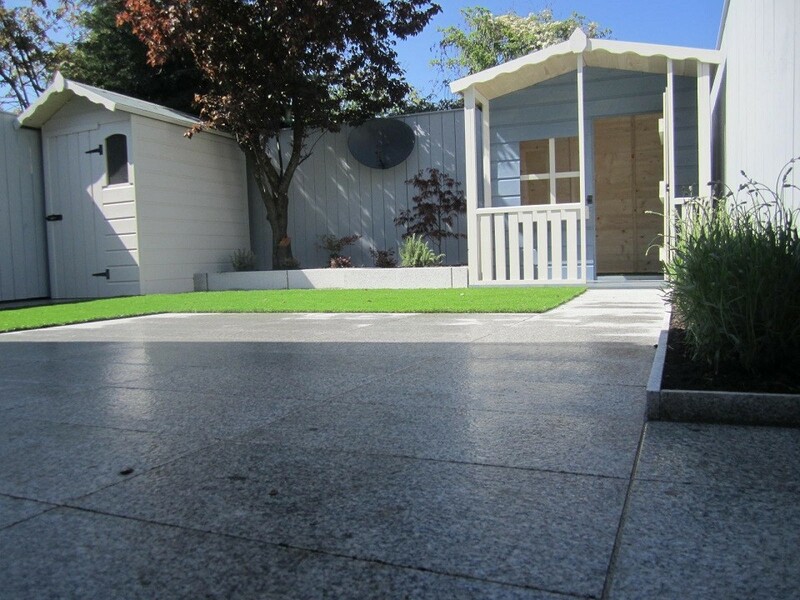 The bed to the back, between the sheds was created using 1000x400x200mm tumbled silver granite kerbs, giving height and grounding the sheds within the space. 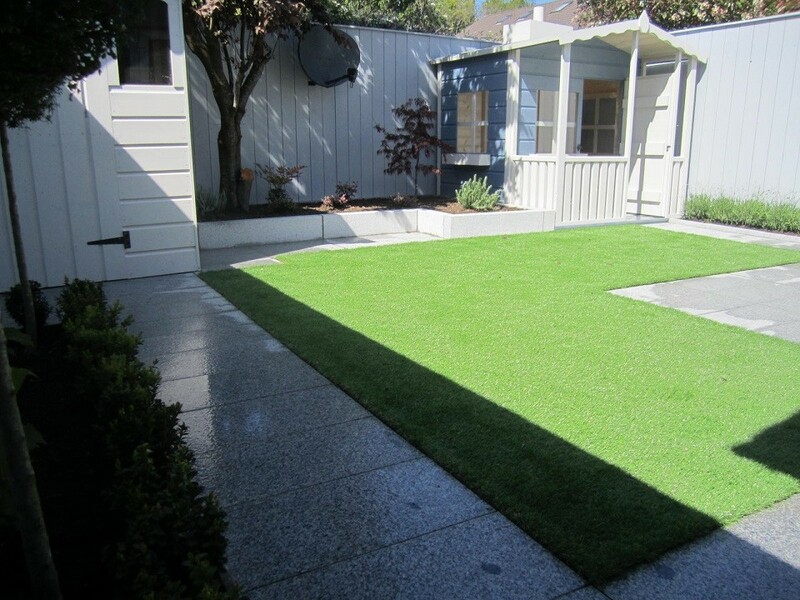 The synthetic lawn was then installed using 40mm ‘Real Turf’, both the sheds also had synthetic grass in, which worked really well. The planting comprised of Lavanduls ‘Hidcote’, Acer palmatum ‘Garnet’, Buxus sempervirens, ligustrum delavaynum standards, Hydrangea ‘Annabelle’, Erica darlyiensis, Nandina domestica ‘Fire Power’ and Drimys winteri. All these plants were positioned correctly so they will thrive into the future. 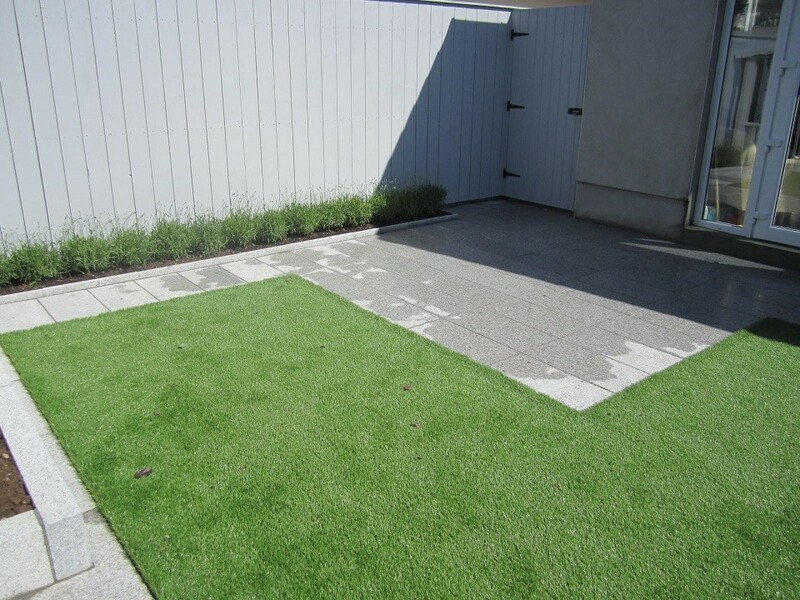 The garden was only small but after landscaping looked larger and created an extra room when viewed inside the new extension. 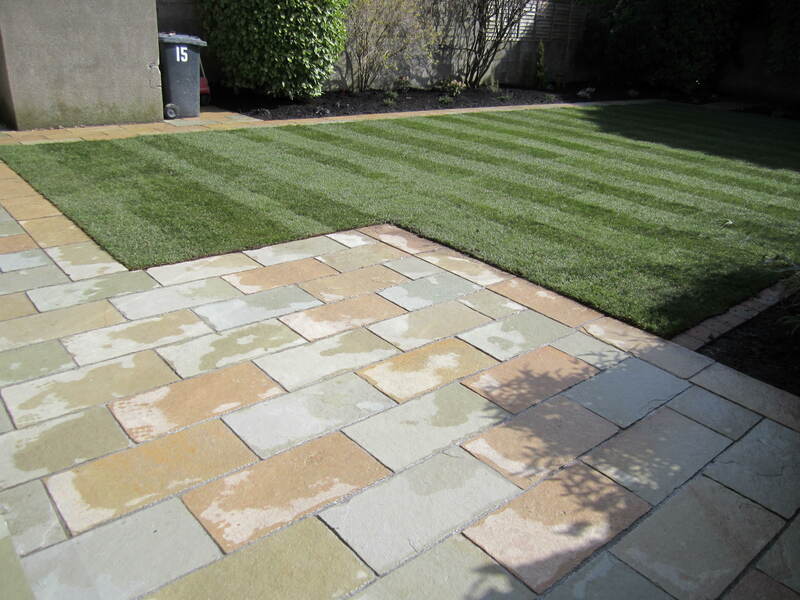 Importantly the deadline for the Communion was met, the original brief was fulfilled and the clients were very happy with their new garden. 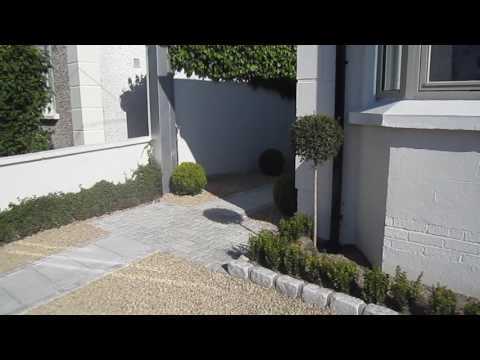 If you require a professional landscaper Wicklow or Landscaper Dublin, contact Kevin Baumann on 086 8198444.